Head north with a stop at Montezuma Castle National Monument. Next, the Red Rocks of Sedona! There will be time for lots of pictures as well as browsing among the many interesting galleries and shops in Uptown Sedona. Visit Jerome, a turn-of-the-century mining town. Admissions are included in pricing. We depart from most hotels in Phoenix, Scottsdale and Tempe. Also, from the Mesa Hilton Hotel in Mesa. We will pick you up at most Phoenix, Scottsdale and Tempe hotels, with the Mesa Hilton pick up point in Mesa. The tour is an incredible mixture of beautiful scenery and the history of Native Americans in Arizona. Visit Montezuma Castle, a Sinagua Indian ruin. Walk along the path and read about this amazing cliff dwelling built in the pre-Columbian era, approximately 1100 to 1425 AD. Next, experience the breathtaking Red Rocks of Sedona. USA Weekend named this town as their top location in their Most Beautiful Places in America list.We will tour this amazing town as your guide points out the various multi-hued rock formations jutting from the high desert floor. Enjoy the views from the Chapel of the Holy Cross. 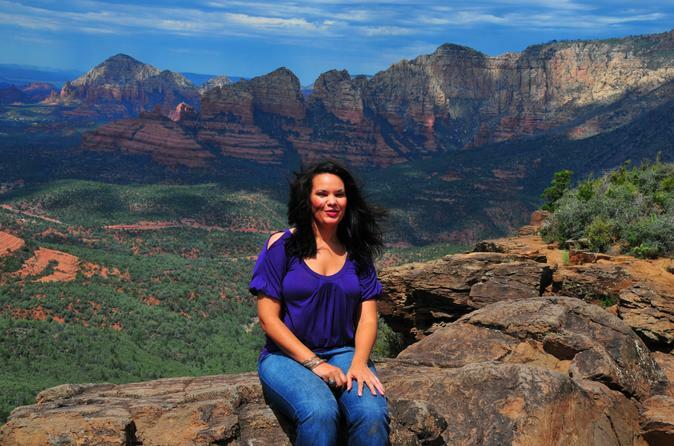 We'll spend time in Uptown Sedona for picture taking, shopping and lunch. Then join us and explore the town of Jerome, Arizona. This town, located on Mingus Mountain, was formerly a copper mining camp founded in 1876. It became a "ghost town" when the Phelps Dodge Mine closed in 1953, but now bosts a population of local artists.